If your child is anything like mine, they love books. I read on average 5 books a day to Genghis. It is a bedtime and nap time ritual to read together. And he loves it when his Grandma reads to him. However, he is separated by a 6 hour drive from my mom. Every time we go for a visit one of my favorite times is when he is curled up with Grandma for a story. But being so far away, it is not always possible for her to read to him. Until now! I was given the opportunity to review one of Hallmark’s recordable storybooks. I instantly had the idea to have the book shipped to my mom so she could record it for Genghis. Then whenever he wanted, he could have Grandma Mary read him a book. First off I love my mom but she is not the most technical savvy person around. She still won’t touch a computer as she is sure she will break it. She said this book was very easy to record and came with very clear instructions. It is as simple as pressing a button, reading the page and repeating for the whole book. Just a few minutes later and the book was done. When the book arrived in the mail Genghis was excited. He gets very happy every time he gets a new book. He insisted that we open it and read it right away. Oh I wish you could have seen his face when we opened it to the first page and instead of me starting to read to him Grandma Mary was reading him a book! It was a look of pure joy and excitement. At least once a week he is able to read a book with Grandma Mary. Buy It: Want your own Recordable Storybook? You can shop Hallmark online or in stores. Win It: One lucky Yellow Tennessee reader will win a All The Ways I Love You recordable storybook. Mandatory Entry: Head over to Hallmark and let me know who you would record a book for. Extra Entries: You can do one or all of these for extra entries. Be sure to leave a separate comment for each entry. All entries are verified. * Become a Follower of Yellow Tennessee (on the left sidebar). * Follow Yellow Tennessee via email (on the left sidebar). * Grab my button and place on your blog (on left sidebar) 3 extra entries. * Post about this giveaway on your blog (linking back to me) 3 extra entries. * Tweet about this giveaway with at least 3 hours between Tweets. 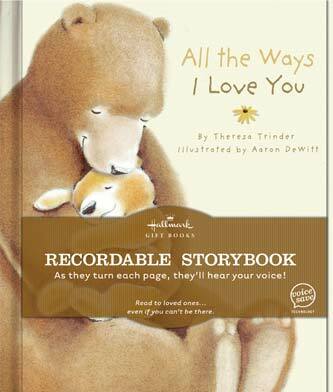 #Win a Recordable Storybook from Hallmark on @YellowTennessee ends 4/20. http://t.co/iJx5mYF. Up to three extra entries daily. * Enter one of my other giveaways. (found on left sidebar). Two extra entries. Entrants 18 and older and from the US are eligible. Contest Ends on April 20th, 2:00pm CST. Winner will be chosen by random.org and announced around April 21st. Winner will be notified by email with “You Have Won the Hallmark Giveaway” in the subject line. Winner will then have 48 hours to respond before a new winner is chosen. Disclaimer/Disclosure: I received a bouquet of my choice in exchange for my review. No other compensation was given. All opinions and views stated are my own. Special thanks to Hallmark for this giveaway!